Leo Brown, 93, resides at The Wyngate, Lima. He joined the Marines Corps, 1001st Platoon, after graduation from Spencerville High School and turning 18. He served from October 1943 to January 1946. He served on the USS Colorado in the Pacific, namely the Philippines and New Caledonia. His job was to feed the ammo to the gunners. 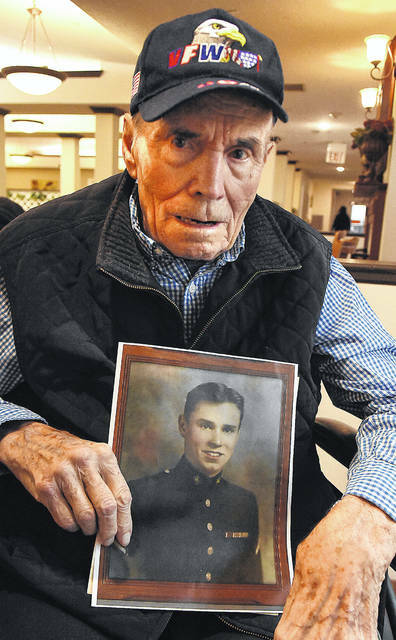 He received a shrapnel injury in the neck when a kamikaze hit the ship and was awarded a Purple Heart. He recovered at New Caledonia fleet hospital and Pearl Harbor, then returned to active duty. The Lima News feels strongly that the service of veterans living in this area should be recognized. This is why this Salute to Veterans section was created and it continues yet today. This special section honors the many men and women who have served our country in the past or who are currently serving our country. Stories from veterans, told in their own words, are published here along with the photos that they shared. For this year’s publication, The Lima News asked veterans to share their thoughts on patriotism and what that means to them. This entry was tagged vet. Bookmark the permalink.